With the support of business and other stakeholders, the UN Global Compact’s governance framework was adopted by then UN Secretary-General Kofi Annan on 12 August 2005, following a year-long international process co-led by Georg Kell, then Executive Director of the UN Global Compact and Professor John Ruggie, then Special Advisor to the Secretary-General. That process included studying networked governance models of other cutting-edge global action and solution networks and holding focus groups with participants and stakeholders, including governments, local networks, and academics. 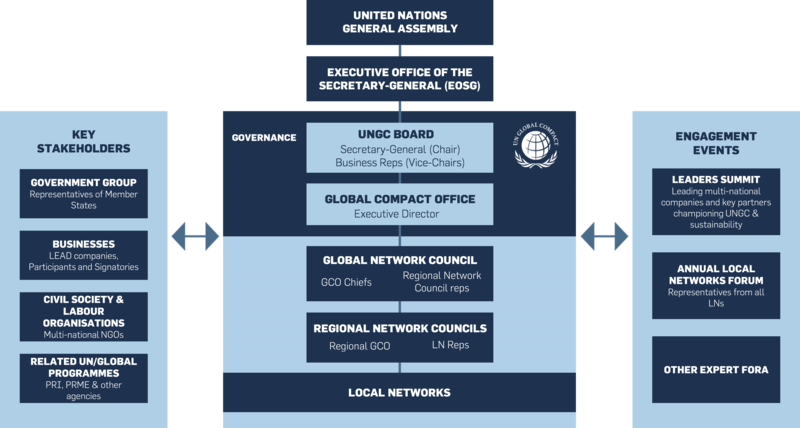 The resulting governance framework distributes governance functions among several entities so as to engage participants and stakeholders at the global and local levels in making decisions and giving advice on the matters of greatest importance to their role and participation in the UN Global Compact, and to reflect the initiative’s public-private and multi-stakeholder character. Refinements have been made since 2005, including the establishment of the UN Global Compact Government Group to formalize the role of Governments.